Item1994.38.81 - Exterior of Sturgeon Valley Archery Ltd.
16 photographs : col. ; 10 x 15 cm. 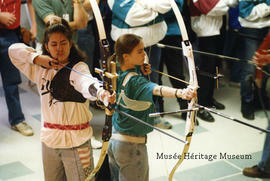 This file consists of photographs from the archery at the 1994 Alberta Winter Games in St. Albert. Photographs depict the exterior of Sturgeon Valley Archery Ltd., archery participants, and medal winners. Photographs were taken by David A. Law and Akemi Matsubuhi.